The Rock Creek Monster Bait Series boards are a perfect fit for big bait. 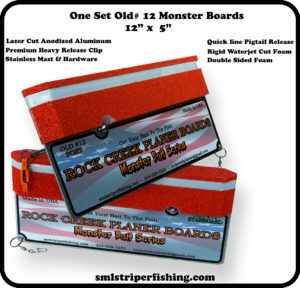 The Monster bait series boards were designed with the trophy Striper fisherman in mind. These boards pull hard to keep your bait where you want it. The Boards feature: Offshore OR-19 Release Clips come as standard equipment and can be used with different line diameters for a better grip to hold on ultra braids, mono filament, lead core or copper lines, yet easily releases with one hand for the fastest release on the water. 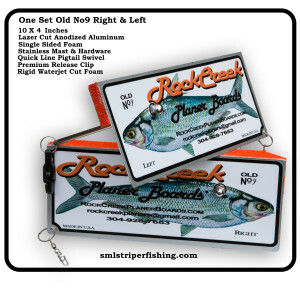 Rear Offshore OR-12 pigtail swivels makes it easy to attach your board to your line and makes it virtually impossible to lose your board unless the line breaks. 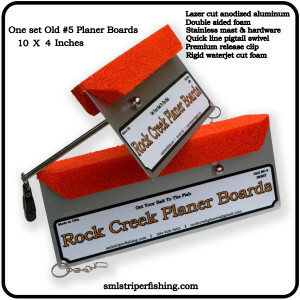 Additional foam to keep the boards on top of the water when pulling big bait. 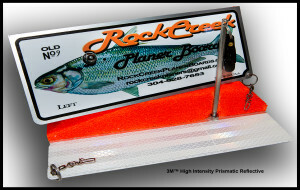 Reflective stripe around the boards makes it perfect for low light and night fishing. The board size is 12″ L x 5″ W.
Please feel free to message us with any and all questions pertaining to the product, and we will do our very best to answer your questions as quickly as possible, within normal business hours. Return Policy : You will have 14 days upon receiving a product to make a return, as long as all contents are enclosed and packaging is unopened/damage free. When receiving a product which is damaged please contact us immediately after receiving the product, and under your discretion we will refund your account, or exchange the product. If there are any problems with the item please contact us.